What follows are tips and recommendations culled from my list of notes gathered over years of adventuring. Many reflect my geezer demographic—for example, the bandana bikini below accommodates generous body types; most treks are “supported,”meaning my older back and shoulders only totes a day pack. I would love to hear about your adventure travel tips. Send them to me at cwford@ravenrocks.com or submit them via the Contact page! I never leave home without at least two cotton bandanas. Most days I wear one around my neck, and stick another one in my small backpack. Who knows when I’ll need to mop up a coffee spill, dry off a rain soaked ferry boat seat, or cover my eyes for a catnap? Bandanas are cheap, lightweight, come in traditional as well as artistic designs, and last for decades, if properly cared for. When adventure traveling my bandana minimum daily number of two swells to five. Many uses are already widely touted and won’t surprise you: for instance, sun scarf if you forget or loose your hat or need extra neck nap protection, dust mask, sweat band, handkerchief for nose blowing, pee and poop “paper” (for those "leave no trace behind" purists), pant or skirt belt, tourniquet, ankle or wrist brace, or pillow cover (to keep a camp pillow cleaner or as a makeshift pillow case over a down jacket). Bathing: Wash cloth, towel in a pinch (best to have two or three available), seat cover for grimy bench or rock you sit on to get socks and shoes back on and off. Bathing suit (bottom and/or halter top): Speaking of bathing or soaking, hot springs can be found in unadvertised places not far from a trail, catching you unawares without your Speedo in areas where modesty is demanded (for instance, Nepal). 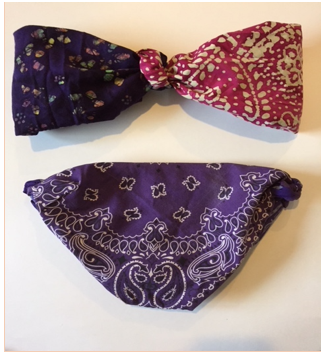 Chances are, four bandanas will be sufficient to improvise a Geezer-kini—two for the top, two for the bottom. Good for Size 14 and below. Dining and cooking: Table cloth, napkin and/or bib, apron, sandwich or leftover wrapper, hot beverage cup insulator, “plate” for dry, solids, pot holder, dish and pot cleaner, coffee filter. Navigating and communicating: Keep an eye peeled in villages and tourist stalls for novelty bandanas decorated with maps or cultural information useful during and after a trek—during the trek a simplified map sketched on a bandana may be easier to access as a reference when asking for directions or updating a daily journal; after the trek as a memento to trigger wonderful memories or spark a conversation from curious fellow travelers. So, here’s the deal about packing for an adventure trip if you’re older. You want to be comfortable. I certainly know from experience I want to be comfortable. I don’t mean hedonistic splendor/in the lap of luxury comfort, but rather items that optimize well-being, ease, and contentedness. I like being warm and snug or cool and casual, depending on what the weather dictates; I want to be rested, healthy, relaxed, and safe and secure to stay focused on each new or renewed experience. My packing list ensures I won’t forget the right number of lightweight fast-drying clothing layers (five when really cold, one or two when hot), TylenolPM (or stronger, like Ambien) for jet lag and ZPacks (azithromycin) for inevitable high-elevation respiratory infections. Apologies to my whole health friends, but herbals/au naturel just don’t cut it for me on the road—no sleep, no fun; lingering sinusitis, a trek stopper. I also make sure I have a hand fan, cash in (US dollars as well as Euros) and ATM cards stashed in several separate strategic places, and a detailed contact list (paper and electronic) with names and numbers to call in an emergency, or when the airport pick up person is no where in sight. Unsustainable, irresponsible travel makes me, well, uncomfortable, so I try to keep Green in mind when packing and adventuring. Focusing seriously on a well-thought out packing list at the front end of an adventure, truly increases the adventure’s success by removing small stresses and making us comfortable. When I was younger, traveling on a ultra tight budget, I assumed comfort on any scale was simply impossible, or at best an indulgence, diluting the the experience's authenticity—being cold, too hot, out of money (until the American Express office opened to replace lost Traveler’s checks), sleeping on night trains (a benefit of Eurail Passes) was the price you paid for adventuring. Now that I’m a wander-codger, with a little more time and a little more to spend, I generally aim for three stars—mid-priced accommodations, guides and support services. The extra money for a bit more comfort and security compensates for what I lack in physical strength, speed and dexterity. Bottom line, packing the right stuff is critical to creating a transformative experience when going beyond my familiar. And, in the end, transformative experiences are my highest priority. I have archived dozens of packing lists from past adventures. When I begin serious preparations for a new journey, I fish out a list from a similar trip to be used as a baseline and begin to customize it—pencil in additional items and scratch off unneeded or obsolete ones. For example, I haven’t packed a monster parka for a decade. Instead, I pack two or three down sweaters or lightweight down jackets, which all together are less weight and more convenient for stashing in a day pack or cramming in empty corners of a duffle. Covered by a water-resistant shell or windbreaker I find down sweaters just as warm as a full-scale parka. I stopped taking along a -25 sleeping bag, opting for a lighter +25, with a separate silk sleep sack and a “half bag” (or down quilt—a bit hard to find but check out Thermodown's prodects). The sleep sack and “half bag” stuff nicely in my carry on, in the event that my duffle goes missing or is delayed. I stopped taking a camera several years ago because my smartphone is plenty good enough for the pictures I want and need to trigger magnificent memories. Under the category of sundries, foot related items have expanded noticeably. (An orthopedist told me I may be 72, but my feet are 172!) I simply can’t leave home without Ibuprofen gel, a variety of silicone pads and toe spreaders, and ankle elastics (I wear these prophylactically, prevents trek-ending sprain or strain). As for reading materials—perish the thought I’d be on a remote trek without enough to read!—I tear out a dozen or so unread New Yorker articles, which offer thin, lightweight, easy-to-tuck-away pages. I usually carry one small paperback for front-end trip reading, to save juice on my e-gadgets. I now carry a Kindle, loaded to the gills. During the trip, I pick up used paperbacks, exchanging them for others at hotels and lodges. No doubt, your adventure packing list will be different, or at least somewhat different. The important thing is that you have what you need to make your amble, ramble or scramble truly memorable, undistracted by discomforts or the lack of items to promote contentedness, ease, and well-being. A sample packing list follows below. I created this list for a 2016, 18-day customized trip to Cuba (before the 2017 Trump order), with a few days extra days in Mexico going and coming. The journey was a mixture of hiking, snorkeling, walking, short bus touring, and research on the status of sustainable adventure tourism in Cuba. Mixed activity journeys to developing economies (Cuba’s an adventure jewel in the rough!) are the trickiest to pack for because of the wide variety of single-purpose items—for instance, trekking poles, clothing and gear, snorkel-googles, and SteriPEN (for UV water purification), along with business casual clothing for meeting tourism professionals and a thick folder of sustainable tourism assessment forms (I really did not want to haul my laptop computer because of unreliable electricity, damage, and loss issues).